On October 13, 2010, ECLA welcomed Dr. Ryszard Legutko as guest speaker for the core course on Plato’s Republic and its interlocutors. A professor from the Faculty of Philosophy and History of Jagiellonian University and translator of many of Plato’s works, Dr. Legutko delivered a lecture on Book Two of Plato’s Republic in relation to the Homeric tradition presented in The Iliad. He first tackled how the premise that justice – as the advantage of the stronger – works within the framework of Homeric epics wherein abstract notions of justice are non-existent. As Legutko stated, justice in the Homeric tradition was primarily based on a code of chivalry, particularly in the setting of The Iliad, where warriors put their lives and reputations up for judgment by their peers. 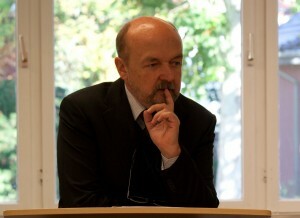 Dr. Legutko evaluated the same premise in the context of Athenian democracy by asking the question: “To what degree do people comply with justice?” Athenian democracy took pride in affording its citizens individual freedom and equality, but different concepts of justice were sources of confusion for many Athenians. As articulated by Dr. Legutko, there were two prevalent concepts of justice in Athens at the time—the first being the meaningful distribution of honor, goods and privileges, and the second referring to justice as getting what is deserved. Both concepts of justice are part of Book Two of The Republic, which features two brothers, Glaucon and Adiemantus, who present claims against justice in the hope that Socrates will refute their notions. Glaucon claims that it is human nature to satisfy all desires without fear of repercussions, and consequently presents two thought experiments to prove his premise. In the first of these thought experiments, the Ring of Gyges, he puts forth a scenario in which external pressures and punishments are removed, making desires immediately attainable. This eventually leads the eponymous character to corruption and injustice by coveting another man’s wife and usurping political power. The second thought experiment, the scenario of the absolutely just and absolutely unjust, depicts a situation in which the unjust has more means of fulfilling his wishes and masking his true nature than the just. Following Glaucon’s point of view, Dr. Legutko concluded that justice, in its absolute form, is self-defeating, while injustice is self-asserting. Adiemantus further develops the idea of the triumph of tyranny by presenting religious beliefs, poetry of the time, and social customs as oligarchic arbiters in daily Athenian life. Justice, according to Adiemantus, is merely a system of rewards and punishments. Dr. Legutko noted the implications of the limited concepts of justice presented by the brothers, which suggest that human nature cannot be fooled by superstructures of morality. This raised the question: Does justice exist by nature or in the soul? Here Legutko closed his lecture, arguing that where justice was external and divine in The Iliad, justice became personal and essentially human in The Republic. After the lecture, faculty and students asked questions, particularly about the city-versus-soul analogy. Dr. Legutko responded with succinct explanations of traditional readings of The Republic. He also shared his opinion that Plato must have been a great lover of politics. His organized presentation was much appreciated, but Dr. Legutko’s claim about Plato’s fondness for politics became a point of debate in seminar groups. ECLA students expressed their desire for a more in-depth discussion of his views regarding Book Two of The Republic. It was in these discussions that one truly felt Socrates in action.